Christianity is the only faith-based (as opposed to works-based) worldview. Christianity is God reaching out to man through the person of Jesus Christ. Our position in Jesus Christ is based, not on works, but upon our faith in the finished work of Christ on the cross. Faith is synonymous with being sure: "Now faith is being sure of what we hope for and certain of what we do not see" (Hebrews 11:1). We exercise faith when we trust in the promises of God. Christian faith is not "blind faith." Blind faith is faith divorced of reason. Christian faith is faith based upon evidences: "We did not follow cleverly invented stories when we told you about the power and coming of our Lord Jesus Christ, but we were eyewitnesses of his majesty" (2 Peter 1:16). We are instructed to know these evidences (manuscript, archeological, prophetic, historical, and statistical), so that we can give thoughtful responses to those who question us about our faith: "Always be prepared to give an answer to everyone who asks you to give the reason for the hope that you have" (1 Peter 3:15). 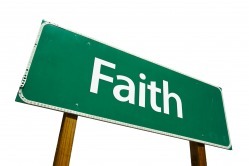 Another concept of faith that must be rejected is the concept that faith is a substance. The belief that faith is a tangible substance that can be manipulated with words is not a concept taught in the Bible, but rather is a doctrine originating with the metaphysical cults. Likewise, the teaching that God has faith and that we are to have "God's faith" is also unbiblical. God is to be the object of our faith -- we are to have faith in God (Mark 11:22). "I have been crucified with Christ and I no longer live, but Christ lives in me. The life I live in the body, I live by faith in the Son of God, who loved me and gave Himself for me" (Galatians 2:20).